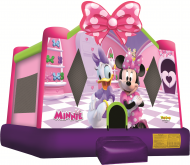 The party kids will have fun bouncing with Minnie themed unit will have your children bouncing and playing for hours with their friends. The unit is colorfully covered throughout and contains Minnies iconic Pink pokadot bow. The perfect bouncer for any Mouse fanatic. Let us deliver to your Davenport, Bettendorf, Rock Island, Moline, East Moline, and Surrounding Quad Cities area Minnie party.